Brixton Hill’s two principal Christmas fairs take place this weekend. On Saturday 3rd December Corpus Christi Primary School will hold its fair 12-4 with Santa’s Grotto plus food and goodies, compered by Miranda Sawyer and Richard Avery. This is followed by Sudbourne School’s Winter Fair on Sunday 1-4 with the traditional stalls and raffle. Entrance £1. Corpus Christi schoolchildren are also taking part in the switch-on of Brixton’s Christmas lights tonight (Friday 2nd December) at 6pm. The principal event in Lambeth for Holocaust Memorial Day this year will be at Corpus Christi Primary School on Trent Road tomorrow, Tuesday 28 January, at 5.30pm. Holocaust Memorial Day is dedicated to the remembrance of the victims of the Holocaust and takes place on the 27th of January each year, the anniversary of the liberation of Auschwitz by the Soviet Union in 1945. The Holocaust Memorial Day commemorative event will be addressed by Professor T. Scarlett Epstein OBE. There will be readings by young people and a performance by the Corpus Christi School Choir. In the league tables of primary schools published this week by the Department for Education, the four primary schools in Brixton Hill ward all performed strongly, in the context of excellent results for Lambeth as a whole. While league tables have clear limitations, these results indicate the improvements local schools have shown in recent years and the excellence we have here in Brixton Hill. Sudbourne and Corpus Christi schools did particularly well according to the league tables, coming second and third respectively in the ranking of Lambeth schools. Richard Atkins and Christ Church schools also out-performed the national average. We congratulate pupils and staff on their achievements. Lambeth schools were also among the best in the country at closing the gap for disadvantaged pupils. 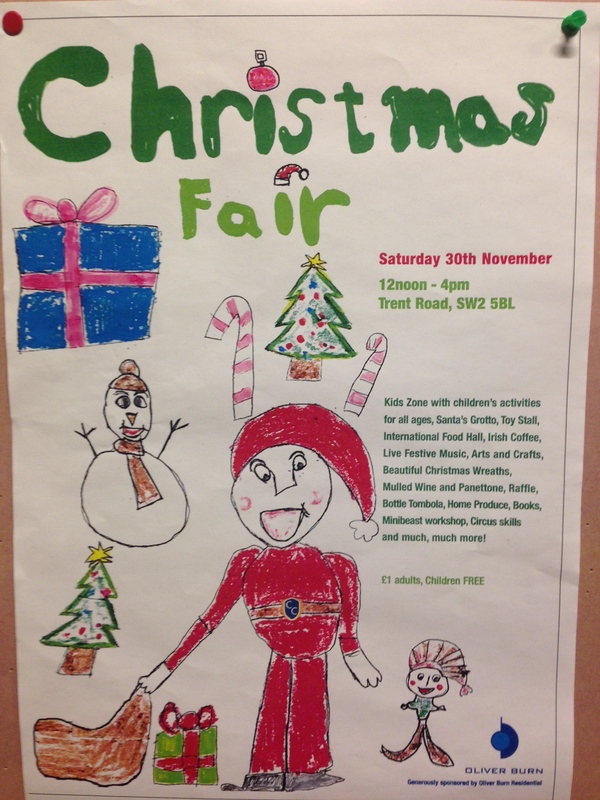 Saturday 30th November sees the Corpus Christi Christmas Fair from 12 noon until 4pm. Head on down to Trent Road for Santa’s Grotto, the toy stall, in the International Food Hall, live festive music, arts and crafts and beautiful Christmas wreaths, mulled wine and Irish Coffee, raffle and tombola, home produce and book stall. Entry is £1 for adults, free for children.